Last week I stayed in Oklahoma City for a few days and had the pleasure of attending week day Mass at St. Francis of Assisi. 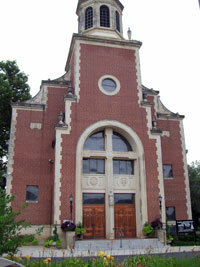 It’s a beautiful church and situated with the Rosary Catholic School. Inside the church and building next door where they have the chapel for weekday Mass you’ll find some beautiful stained glass windows. They’ve got pictures of them on their website as well as a virtual tour.